This is Tim Tebow’s 2nd season in the NFL. First he had to endure a slew of experts who knowingly claimed that he would never be a successful quarterback in the pros. Then when he became a sensation by helping his Denver Broncos win a number of close games he also became the subject of ridicule from folks like atheist Bill Maher, along with comedy sketches from SLN and South Park. 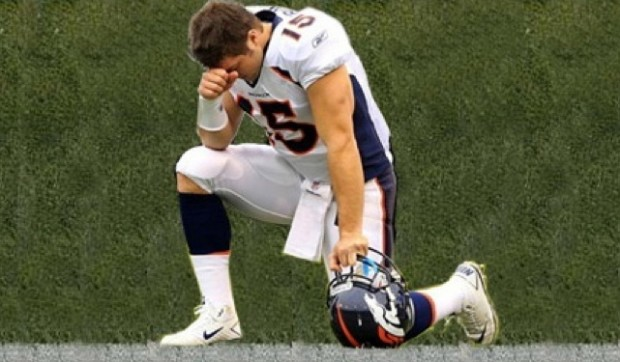 Plus several opposing players mocked Tebow by pretending to knell in prayer on the field right in front of him. Meanwhile Tim Tebow took it all in good humor and responded with total classiness towards all while praising God and thanking Jesus. Then last weekend in a playoff game against the Steelers who were supposed to be a far better team then the Broncos, Tim Tebow pulled off an overtime ‘miracle’ win for his team. In the process he passed for an incredible 316 yards and averaged 31.6 yards per pass before a TV audience that achieved a 31.6 rating producing a repeated set of numbers that was reminiscent of Tim’s favorite Bible passage– John 3:16. This week in the aftermath, one article after another has been published by one religious leader after another reminding us that is is just football after all and God would never be aroused from his great responsibilities to help one Christian win a game over another team that after all also had some Christians on it. Worse yet, the secular media has gone out of its way to find one pastor after another to criticize Tebow for dragging the name of Jesus onto a football field. Up to this point, it has all mostly been in fun and it has been nice to see a young Christian succeed against all of the long odds against him and continue to win in the face of all of the opposition against him and then praise the Lord in the aftermath. However, it is hard to calculate how despised and resented Tebow is in the secular and atheist community. It is also impossible to gauge how much of a hero he has become among many Christians. For better or worse he has become a symbol for evangelicals in America and a lightening rod for the opposition against Christianity. Now comes an unfortunate turn of events. Today, it was reported that a coven of witches in Salem, Mass. were casting spells, doing rituals, and calling on ‘Spirits’ to help Tom Brady and the New England Patriots defeat Tim Tebow and the Denver Broncos tomorrow. What was destined to be a fun football game has now become a spiritual confrontation instead. It may not be Mt. Carmel, but a ‘spiritual’ gauntlet has been thrown down none the less. On the face of it, Tom Brady is a far better quarterback and the Patriots are heavily favored in the contest having soundly beaten the Broncos earlier in the season. They really didn’t need the extra ‘spiritual’ help and it will take a miracle to beat them. This entry was posted in Christian Living, Witnessing and tagged Tebow. Bookmark the permalink. Aren’t you concerned at all that Tebow is blatantly breaking Jesus’ clear command in Matthew 6:5-6? It is a matter of cultural context- I don’t believe he is doing his public prayers in order to receive personal accolades. In our culture more despise what he is doing than respect it. In Jesus’ day those praying in the street received respect and awe from the observers who considered them to be ‘super spiritual’-a good thing in that day. Not so in our more secular society.